Simply stunning! The Hydrangea Medical ID Bracelet is an interchangeable design that goes with just about everything. 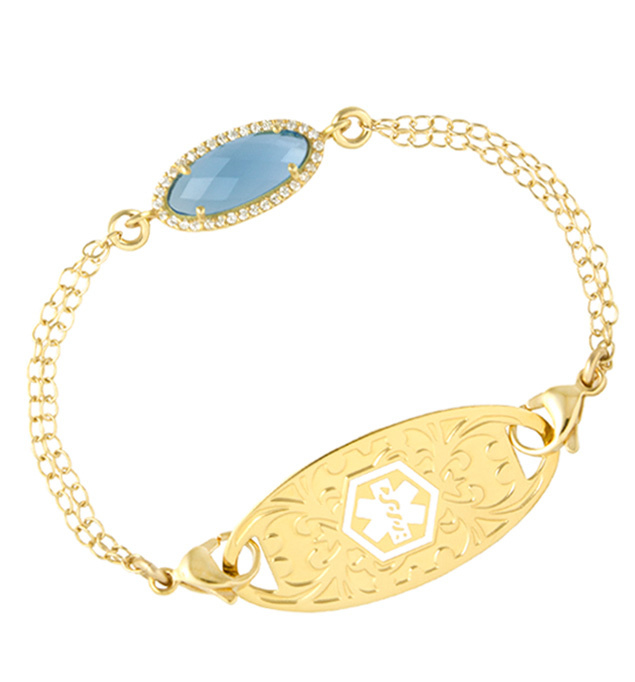 With two strands of petite gold chain and an oval-shaped, London Blue quartz centerpiece set in a cubic zirconia-encrusted, 24k-gold-dipped bezel, Hydrangea is gorgeous alone or stacked with your favorite gold jewelry. Pair it with your favorite gold-tone medical ID tag for delicate look that’s crafted to last. As with all of our interchangeable designs, your Hydrangea Medical Alert Bracelet pairs with any custom-engraved Lauren’s Hope medical ID tag, keeping what’s truly most important to you right at hand. This stylish med ID is a great choice whether you or your loved ones wear medical alert bracelets for a history of adrenal insufficiency or Addison's Disease, lymphedema or post-mastectomy care, hypertension, steroid dependency, or any other medical condition or treatment consideration. Custom engraving allows you to choose the look you want so you can stay safe in style.